Palestinian experts agree that Washington is now using a “money for politics” strategy in Palestine, meaning that in order to receive aid the Palestinians must first agree to accept all US conditions. This is now its preferred modus operandi, especially under the administration of US President Donald Trump, regarding the Palestinian-Israeli conflict. The US State Department has announced that more than $200 million in aid to the West Bank and Gaza Strip will now be redirected to other programmes, according to a decision by Trump. The aid will be withdrawn under the Taylor Force Act that reduces US financial aid to the Palestinian Authority (PA) in order to guarantee it is spent in accordance with US interests. Observers believe that the decision is blatant political and financial blackmail on the part of the US, which wants to impose its “Deal of the Century” on the Palestinians. It follows an earlier decision to freeze $65 million in funds to the UN refugee agency UNRWA even as the Israeli government has received some $40 billion in US aid over the past decade. Hanan Ashrawi, a member of the PLO’s Executive Committee, condemned the move and said Washington’s bullying and punishing a people under occupation would diminish its standing in the international community, its deplorable behaviour indicating its political and moral bankruptcy. The US was acting in complicity with an occupation that has stolen land and resources and has imposed economic sanctions that further punish the victim and reward the aggressor, she said. Saeb Erekat, secretary-general of the PLO’s Executive Committee, also condemned Washington’s decision, adding that the Palestinian people rejected any preconditioned assistance. He said the decision was a scandalous admission of the true nature of US aid, which was to intervene in the domestic affairs of other peoples and influence their sovereign choices. “Aid is not charity to our people, but the duty of the world community which is responsible for the continued Israeli occupation that has blocked Palestinian development and economic and social growth,” he said. Jack Youssef Khazmo, a Palestinian commentator, said the hostile policies followed by the US aimed to please Israel and bolster the strategic alliance between the two countries. They were an affront to the many Arab leaders who rely on the US and comply with directives that insult the Arab nation, he said. The withheld funds are very small compared to what the Arabs have given to the US in the form of $500 billion in Arab investment, Khazmo said. Disregard of the Arab position was also due to the Palestinian cause now taking a backseat in the US. The greatest insult was not the cutting of financial aid, but the US recognition of Jerusalem as the capital of Israel and the right of return of the Palestinian refugees, he added. He urged the PA to continue to refuse US mediation and urged it to join those opposed to US policies in the region. Political analyst Thabet Al-Amoor said that improving people’s lives was an urgent necessity in Palestine. Historically, the goals of the Israeli occupation have been to paint the issue as a purely humanitarian one, and after 1948 Palestine was portrayed as simply a humanitarian issue with its people needing clothing, food and other basic needs. Today, the world is still prepared to give priority to the humanitarian over the political, he said, meeting the humanitarian needs of the Palestinians without transitioning to a just and comprehensive political solution to the Palestinian cause. Al-Amoor cautioned that it was impossible to separate the political and humanitarian, however, because the political serves the humanitarian. Ending the occupation, the return of the refugees, the status of the holy sites and the question of Palestinian rights all converged and could not be compromised for the sake of meeting humanitarian needs, he added. Omar Shaaban, a Palestinian economics expert, said the budget of the PA would not be immediately impacted by Washington’s decision to slash $200 million in aid because it did not directly benefit from it. “The US administration does not directly fund the PA budget, but the EU and other donors contribute regularly, as do civil society, the private sector, and international agencies operating on the ground such as UNRWA, the World Bank and UNDP,” Shaaban explained. He said the US had decided to suspend assistance in December as it slashed its contributions to UNRWA. US aid, he noted was dispensed through US institutions and companies working in the Palestinian Territories, such as USAID and others. “The impact of the US decision became apparent several months ago when the decision was announced, with many US agencies terminating contracts with local employees, NGO partnerships and some humanitarian and employment programmes,” he said. “It is certain that the US withdrawal of these funds, already frozen for a year, will amplify the economic crisis in the Palestinian Territories and increase unemployment, especially among young people and women,” he added. Shaaban believes that supporting self-funding, an austerity approach to exclude unnecessary spending, increasing remittances from Palestinians abroad, and improving cooperation with friendly countries are ways to avoid political pressures attached to aid money. In January, the US substantially reduced its share of the UNRWA budget, forcing it to fire more than 250 employees. Relations between the Trump administration and the PA have been frozen since Trump announced on 6 December that the US would officially recognise Jerusalem as the capital of Israel. The decision was met with widespread international rejection and Palestinian anger. Trump then said at the end of January he would make aid contingent on the Palestinians returning to the negotiating table. He froze $215 million in US aid that should have gone to Gaza and the West Bank for humanitarian and development needs. 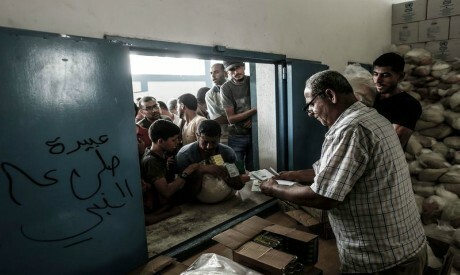 The PA budget has a large deficit and living conditions in the Gaza Strip under Hamas rule are deteriorating quickly due to the siege by Israel. The 2018 budget of $5 billion has a $1.2 billion deficit, and foreign aid amounts to only $775 million. Withdrawing the US aid will impact humanitarian and infrastructure projects in the West Bank and Gaza Strip. The White House has so far not decided to alter the $61 million in funds earmarked for PA security forces this year, since Israel views cooperation with these Palestinian agencies as necessary to prevent attacks. The Palestinians insist that the status of Jerusalem must be decided through peace talks, as does the international community. While Washington’s recognition of Jerusalem as Israel’s capital was welcomed by Israelis, it was condemned in the rest of the world and by Palestinians who want East Jerusalem to be the capital of their future state. The international community views East Jerusalem as occupied land, and foreign embassies cannot be located there before its status is settled. For Palestinian leaders, the right of return of the Palestinian refugees in the West Bank and Gaza Strip, Jordan, Lebanon and especially Syria is key to possible negotiations with Israel. Some 750,000 Palestinians fled or were expelled from their land when Israel was created in 1948, and their descendants now amount to five million people, according to UNRWA, though Israeli television has reported that the White House has decided to recognise only 500,000 of them. In 2018, Washington earmarked $65 million to UNRWA even though it paid $360 million in 2017, or around one third of the agency’s funds.